and decided this was a good way to do it. His obvious next step was to wait a day or two, then tell some other reporter that, you know, he didn’t really know for sure, and then congratulate himself for winning a news cycle or two. A second source, said to be “close to Senator [Harry] Reid,” has told CNN’s Dana Bash that Reid’s original source for the claim that Mitt Romney “didn’t pay any taxes for 10 years” exists, is a “Bain investor” and a “credible person.”…. I did speak to one source who is very close to Senator Reid who claims to also know who the Bain investor is that Reid spoke with, and insists that it is a credible person and this person if we knew the name we would understand they would have the authority and the ability to know about Romney’s tax returns. This is all pretty weird. 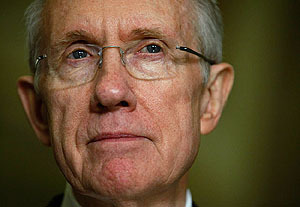 In one sense, I suppose Reid isn’t really risking much. He’s not up for reelection, after all, and it would be pretty hard for anyone to prove that he’s lying. And even if he is, so what? Is Mitch McConnell going to start obstructing Senate business even more? How could he? Still, Reid isn’t leaving himself any breathing room at all on this, and if he gets caught out it would still be pretty damn embarrassing. He’s taking one for the team in a way that I’m not sure I’ve ever seen from someone in a leadership position. Is it because he’s 72 and doesn’t care anymore? Because of some longstanding intra-Mormon feud? Because he’s just fed up with Republicans? I dunno. But if he can’t back this up, it’s about as sleazy a ratfuck as we’ve seen since the days of CREEP. UPDATE: Eric Rauchway tweets, “Sleaziest since CREEP? Does @kdrum remember the 1990s?” Point taken. Between Willie Horton and Bill Clinton’s black baby and Al Gore’s earth tones and the great Swift boating of 2004, Reid’s gameplaying probably doesn’t make the ratfucking top ten. Still, it’s a little different when it comes straight from the Democratic leader in the Senate. Is that better or worse than conducting this kind of stuff in the shadows, or at arm’s length from the campaign? I guess you could argue both ways. But I’m really not sure we should be thrilled with high-ranking party leaders openly embracing this kind of stuff. If Reid had said, “You know, my guess is that Romney didn’t pay any taxes at all in some years, and that’s why he won’t make his returns public” — well, that would have been fine. Just rank speculation of the kind that lots of people have engaged in. (Including me!) But when he specifically says that he has some secret source who’s seen Romney’s returns, that’s different. That’s almost certainly a lie. No matter how tempting it is, this really isn’t something we should be applauding.